Think of how sore your feet get after a long walk. The same happens for your tires. After each drive, our tires take a beating. 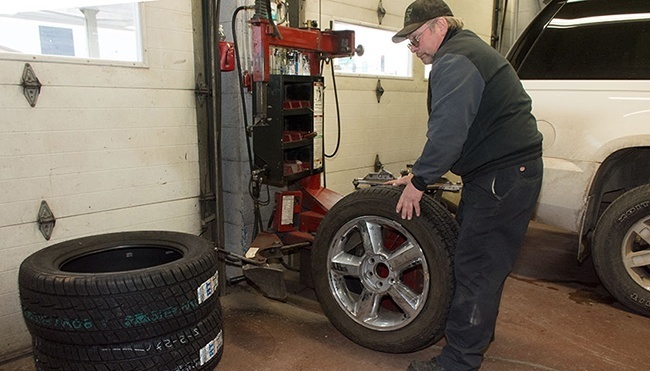 At Jack’s Auto Service, it is our job to replace your old tires with new tires, which are ready for the road the ahead. Our team wants to make sure you and your family continue to drive safely and smoothly around Grand Rapids. We offer thorough and reliable auto repair, including tires and alignment service, at a competitive price. The depth of your tires falls below 1/16 of an inch. Several models of new tires have an indicator built in. This indicator, or similar to a bar, is visible as the tread wears down. If you have tracks in the sidewall of your tire, you, most likely, need new tires. When the outer surface of your tire weakens, bulges or blisters will appear in your tire. When you are driving, you feel a constant vibration from your tires. If you are experiencing any of the signs above, do not hesitate to contact us for tires and alignment inspection. Our team is experienced, education, and reliable. We use only the latest and highest-quality tools and equipment to install new tires on your vehicle. If your personal automobile or fleet is in need of new tires, maintenance or repair, we invite you to Jack’s Auto Service in Grand Rapids. You can trust our friendly and experienced staff to get your car, truck, minivan or SUV driving its best!